Experience five-star luxury at Istanbul’s Gonen Hotel, located just a short distance from Ataturk International Airport. Our Istanbul luxury hotel has very easy access to the CNR-Expo and World Trade Center and is an attractive 5 star hotel in Istanbul with the highest quality of guest rooms and conference venues in Istanbul. Offering super chic and contemporary Istanbul accommodation, Gonen luxury hotel in Istanbul includes 305 stylish, well-appointed guest rooms and suites. Only 8 minutes from the Istanbul Ataturk Airport by a complimentary airport shuttle service, the Courtyard hotel offers you everything that business stay requires; high-speed Internet, ergonomic work-spaces, business center and GoBoard touchscreen.Our hotel ideally situated in the triangle composed of CNR-Expo Center, Istanbul Fair Center and Tuyap Fair Exhibition and Congress Center and also close to the excellent shopping malls. The energetic, spacious bedrooms have sound proofing and air conditioning, and each features flat-screen TVs, tea/coffee facilities, mini-bar. Enjoy Mediterranean and Turkish cuisine at Oleo Pazzo Restaurant, and end the day with a toast at our Lobby Bar. Release all your stress in the Caretta Health Club & Spa, make a splash in the indoor pool or maintain your workout routine in the fitness center. Whether it’s finishing up work or indulging in downtime, book today at Courtyard Marriott Istanbul International Airport. Holiday Inn Express® Istanbul Airport Hotel located on Basın Express Road as one of the most important transportation routes in Istanbul shall ensure you experience privileged days with both advantages from its location and the superior services. Our Hotel with its location on Bas1n Express Road at the key point at which important points of European Side meet is a popular address of both special events and meetings, and shall bring you comfort with the transportation facilities. 24-h room service, airport transfer, car park, vaults in the rooms and change/ exchange services in our Hotel will provide you with the perfect service and comfort with the Great Room, meeting halls and full equipped rooms; and shall make you calm resting environment in the middle of the city with its green areas. Featuring free WiFi and a fitness centre, Cloud7 offers pet-friendly accommodation and located only 5 km away from the airport in Istanbul. A Smart flat-screen TV with cable channels has screen mirroring feature with Android and IOS devices. Some rooms include a seating area to relax in after a busy day. Private bathrooms have equipped shower with a waterproofed Bluetooth speakers. For your comfort, you will find a hairdryer. You will meet Turkish hospitality with German standards. Surrounded by entertainment and commercial center, shopping malls and exhibition venues, you are at the heart of Istanbul, in short at the center of life. Steigenberger Airport Hotel Istanbul is located just five kilometers from Ataturk International Airport and 20 kilometers from the world famous Istanbul Old City, historic Sultanahmet district. Every room at this hotel is air-conditioned and is fitted with a flat-screen TV with satellite channels. Rooms are equipped with a private bathroom. The hotel is also within easy access to the IFM and CNR Expo Center. Yenibosna Metro Station is located a 8-minute drive from the hotel. 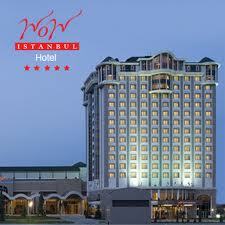 Halic Congress Center is 17 km from Steigenberger Airport Istanbul, while Taksim Square is 26 km from the property. This hotel offers 209 luxurious and modern bedrooms. 42-inch HD television, desk, safe, minibar, carpeted floor and tea and coffee-making facilities provide for a comfortable stay. Facilities include a SPA and Sports Centre, indoor pool, making your stay a memorable one, whether for short or long-term business leisure. In addition, there are 3 meeting rooms and a Grand ball room, fully-furnished and equipped to cater for your business needs. ALRAZI HOTEL is located near to Ataturk Airport ( 2,5 km ) , CNR Expo (3 km) and Tuyap Fair & Exhibiton Center ( 15 km) and Istanbul World Trade Center. Metrobus and bus station is walking distance the hotel. You may live the business and vacation together at Alrazi Hotel with totally 145 rooms included 21 Economic , 76 Standart Double , 40 Standart twin and 8 Superior rooms. The hotel is pleased to host you with modern – classic designed furnitures and equipments.It provides free private parking on site. You can find something for every taste by enjoying Turkish and international cuisines at breakfast ,lunch and dinner at Alrazi Firinbasi Restaurant. We offer all kinds of facilities with our meeting rooms, which are designed for our guests who are planning to organize social events, wedding and organizations. 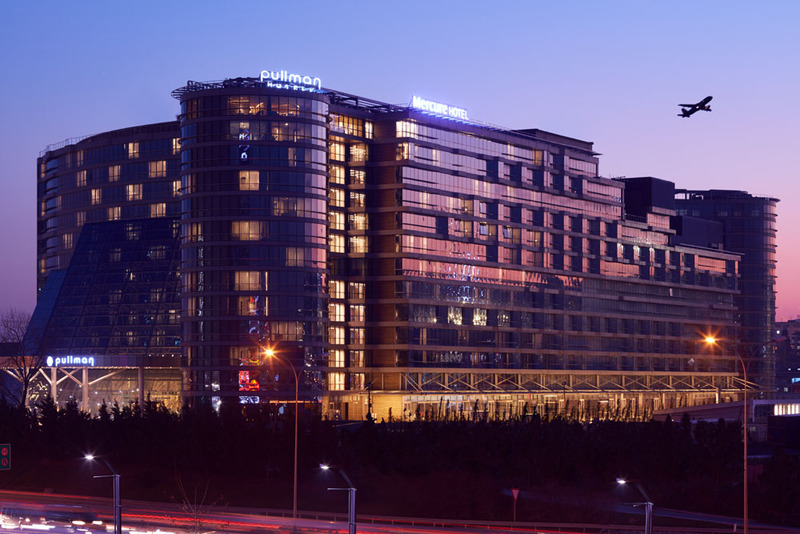 Pullman Istanbul Airport Hotel & Convention Center is only 2 kms away from the airport and the hotel is easily accesible through good highway connections. With its 403 rooms, Pullman Istanbul Airport offers its guests the luxury and comfort that they deserve. The convention centre that exceeds 16.000 m2 in total enables the meeting organisers to host variety of events from exhibitions, meetings, seminars and ceremonies. The 3500 m2 spa offers relaxation areas and treatement along with a fitness centre. You will also enjoy the delicacies of Turkish and International cuisine that will rejoice your tastebuds along with special cocktails from around the world that is served in our enjoyable bar areas. This and many more awaits you at the Pullman Istanbul Airport Hotel. Offering 377 rooms, the contemporary Mercure Istanbul Airport Hotel features a sauna and a hairdresser available on site. Mercure Istanbul Airport Hotel was opened in 2014 and offers soundproof rooms. Set in Bahcelievler district of Istanbul, around 25 minutes' walk from CNR Expo Center. There are an oceanarium and a stadium in the area. The venue is set next to a mall and fairgrounds. This hotel comprises of superior king room, corner suite and superior single room that come with modern décor as well as wireless internet, a laptop safe, multi-channel television, a closet and a sofa. The rooms look on to the city. They also have en suite bathrooms with a hairdryer, a bidet and free toiletries. A buffet breakfast is offered at the restaurant. The casual restaurant amazes guests with tasty international dishes in a special atmosphere. Guests can unwind at the Avenue bar, serving a wide range of coffee and tea as well as appetizers and sandwiches. Cihangir Doga BalIk Akarsu offer an assortment of dishes within 900 meters of the property. Ataturk airport lies within 10 minutes' drive away from Mercure Istanbul Airport Hotel. The hotel provides a car park, a beauty salon and a luggage storage along with a slide projector, a movie projector and printers to fit the needs of all guests. Renaissance Polat Istanbul hotel, ideally located, with easy access to Istanbul International Airport, CNR-Expo, IDTM and all major Istanbul motorways, provides you with first class service & accommodations for both, your business trip or Istanbul holiday. Shuttle service to and from Atatürk International Airport with fee. Renaissance Polat Istanbul Hotel features spacious air-conditioned accommodations with the luxurious Renaissance revive bedding, safe and LCD screen TV's. After a restful night on our luxurious signature bedding, take a dip in our swimming pool or work out in our on-site fitness gym. For dinner, catch up with family or colleagues while enjoying a selection of Restaurants or relax at Noblesse Bar while having a drink with the amazing views of the Marmara Sea. Conference facilities in Istanbul offers 10 function rooms accommodating up to 1600 guests as well as catering and wedding services. Renaissance Polat Istanbul Hotel, our friendly staff awaits your arrival! Executive rooms which all come with Executive Lounge benefits. For the big families we have 14 family rooms with 2 bedrooms interconnecting. Enjoy panoramic sea view from the large balcony of 8 Deluxe rooms. Sheraton Istanbul Atakoy is conveniently located in proximity to central areas and ring roads, only 8 km to Atatürk Airport; 10 km to Istanbul’s center and tourist magnet Sultanahmet; and in walking distance to Galleria Mall and Atakoy Marina Park including 200 stores, 12 movie theaters and dining opportunities.Sheraton Istanbul Atakoy Hotel satisfies all needs by attending every minute detail in 285 guest rooms (24 suites, specially designed 27 Club rooms) all affording a sea view, Trendy Lounge bar acclaimed for its offbeat music and concept; main restaurant CookBook; Sumach Turkish Cuisine, the tasteful journey of Ottoman Palace Cuisine and Turkish Cuisine; Sheraton Gourmet with its breads, fresh cookies, and seasonal pastries, 9 meetings and 2 ball rooms designed to meet all wants; indoor and outdoor swimming pools and Positive Spa & Fitness Club comprising a massage and fitness gym, children’s play parks, running track, clay tennis courts, sauna and Turkish bath.All Sheraton Istanbul Atakoy rooms boast comfort amenities including specially designed bed, air conditioner, LCD TV with satellite, data port, wireless internet, electronic safe, tea/coffee maker, mini bar, iron and ironing board.A fully-equipped bathroom is featured in all rooms with a telephone and hair dryer. Elite World Business Hotel, which is one of the best business hotel in İstanbul is conveniently locates near Istanbul Atatürk International Airport, close to CNR and Tüyap Fair Centers. Luxurious 181 rooms and suites, 11 meeting rooms with a capacity of 2000 persons, authentic examples of turkish and international cuisines and a careful service are offered in our restaurants. The ‘’Coffee Company’’ where you will be eating your daily cake and sipping your coffee with pleasure, The ‘’One Bar’’ where you will be enjoying the music , the “Loliva” where will be eating various selection from Italian Cusine, the fully equipped health center, business center and many more attractions are waiting for you at Elite World Business. Radisson Blu Conference & Airport Hotel, Istanbul conveniently located 2 km from Atatürk International Airport and several shopping centres. This 5-star hotel offers modern rooms with free WiFi and a flat-screen TV. Facilities include a wellness centre with an indoor pool. Free airport shuttle services are available.The air-conditioned rooms at Radisson Blu Conference & Airport Hotel Istanbul are decorated with contemporary furniture and warm colours. All rooms have a seating area, minibar, and tea and coffee making facilities.At Olivos Restaurant you can start your day with a breakfast buffet, and enjoy Turkish and Mediterranean cuisines throughout the day. Mandarin Bar pours a variety of creative cocktails in a contemporary setting. The modern Atrium Lounge offers coffee, light fare, sandwiches and appetisers.Radisson Blu Conference & Airport Hotel Istanbul offers free shuttle services to and from Istanbul’s Atatürk International Airport.Metrobus station is only 500 m from Radisson Blu Conference & Airport Hotel Istanbul. The hotel is situated less than 2 km from the CNR Exhibition Centre and the World Trade Centre, and Tuyap Fair Centre is 19 km away. Istanbul’s historic centre is 21 km away while Grand Bazaar and Spice Market are 17 km from Radisson Blu Conference & Airport Hotel. Just 7 km from Ataturk Airport, this 5-star hotel has a heated indoor pool and offers air-conditioned guestrooms with free Wi-Fi. Holiday Inn Istanbul Airport Hotel offers free shuttle service to Ataturk Airport and city centre.Most rooms at the Holiday Inn Istanbul Airport Hotel have parquet floors, double-glazed windows and modern furnishings. They come equipped with a minibar and a flat-screen TV with cable channels.The Tulip Restaurant offers international cuisine while the Saltanat Restaurant serves Turkish and Ottoman dishes. The Holiday Inn Istanbul has a café, and a bar with city views that serves cocktails.At the Mandala Spa guests can enjoy a Swedish massage, or relax in the steam room. There is a state-of-the-art gym that features cardiovascular equipment. The tour desk assists with car hire and offers information on local attractions.The Holiday Inn Istanbul Airport Hotel is 7 km from CNR Expo Centre, 1 km to 212 Shopping Mall and a 10-minute drive from Atatürk Olympic Stadium. It provides free private parking on site. Ramada Plaza Istanbul Tekstilkent is a business hotel. Located 13 km from the old city area of Sultanahmet, 19 km from Taksim and 15 km from Ataturk International Airport, it has a prime central location. The CNR Expo Fair Center or the TUYAP Fair and Congress Center can be reached in a short 20 minutes by car. Ramada Plaza Tekstilkent pleased host its guests in spacious and bright rooms. It has 276 Deluxe 30 Executive Suites and 16 Corner Suits a total of 322 rooms. Conveniently located, the hotel is ideal for professionals traveling on business and it distinguishes itself by offering guests all the amenities of modern life and an appealing variety of rooms to choose from. This hotel in Istanbul is perfect for business and holiday travellers alike because it’s close to the Istanbul Ataturk Airport, the CNR Expo Centre, the Istanbul World Trade Centre and lots of shopping centres and outlet malls. Take advantage of our free shuttle service to and from the airport (available at specific hours) and local shopping centres, or catch a ride on a public bus, which stops right in front of the hotel. The hotel has 154 stylish rooms, including 2 rooms specially designed for those who need accessibility features. Start your morning well with breakfast at the Live-inn Room Restaurant. For lunch and dinner, sample a Turkish dish or your favourite pizza or gourmet burger at RBG Bar & Grill. Spend a soothing day at our spa centre, which has an indoor pool, fitness area, massage and treatment rooms, hammam, sauna and steam bath. We also offer outdoor car parking, a business centre and 7 flexible meeting rooms, the largest of which can accommodate up to 340 people. Just 4 kilometres from Istanbul Ataturk Airport, the hotel has a shuttle service to and from the airport during specific hours. Walk to places like the event hall Arena Mega or take our shuttle to nearby shopping centres. All 154 rooms include Free Wireless High-speed Internet and access to the spa centre. With our RBG Bar & Grill, Live-inn Room Restaurant and lounge, you can dine from early in the morning until late night. Enjoy a cocktail or a glass of wine out on the terrace at the RBG Bar & Grill. Experience true relaxation at our spa centre’s fitness area, indoor pool and sauna. We offer on-site car parking and a fully equipped business centre. Take your meeting or special event to the next level with one of our 7 multifunctional meeting rooms, foyers and terraces. Airport hotel Istanbul conference for 220 persons, 470 fitness personality, organization, and has a capacity Wedding ;220-square foot event space offers of. Among Istanbul’s 4-star hotels, Gunes Hotel stands out for the professionalism of its qualified staff that will provide on-time service from the moment you arrive in Turkey to ensure you enjoy a comfortable and safe stay. An excellent solution for business clients thanks to its proximity to the airport, the Istanbul trade fair and the sites of important corporations, Gunes Hotel features meeting rooms, gym and wellness center. Equipped with every comfort, each of the 130 spacious, welcoming and inviting rooms of Istanbul’s 4-star Gunes Hotel features unique dimensions and furnishings. Some are wheelchair accessible.Set in a tranquil and peaceful atmosphere, our rooms include free Wi-Fi coverage, air conditioning, direct telephone line, satellite TV, room service and many other amenities.Istanbul’s 4-starHotel Gunes features 2 spacious and elegant meeting rooms, which make appropriate venues for any event: meetings, work conventions and banquets.Equipped with the best in modern technology, the capacity of these rooms ranges from 40 to 250 seats. Meeting rooms may also be split into two or three sections by using special mobile dividers. Novotel Istanbul City West welcomes its guests at its very convenient location, 10 kilometers from the international Atatürk Airport and conveniently close to the historical peninsula and major shopping areas. The hotel has 208 rooms, a restaurant, a bar, meeting rooms and a wellness center with an outdoor pool. The rooms have been designed as spacious, comfortable living areas where you can enjoy a minibar, a 32 inch flat-square TV set whereby you can watch all the world channels, free wireless internet connection, and free tea and coffee services. Apart from free wireless internet service, there are also a business corner and a MAC corner for the comfort of our guests. The “YOU” guest satisfaction program is practiced to answer to our guests’ demands immediately and makes it possible for you to reach every service unit within the hotel with a one-touch dialing. There is one main restaurant and one bar at the hotel, which are tranquil and peaceful places that enable our guests to enjoy their meal time far from the busy and tiring atmosphere of the daily turmoil. The Meeting@Novotel concept, created with today’s meeting demands in mind, is continuously renewed and developed. Meeting@Novotel makes a commitment at five points for its guests; instant availability, hassle-free mettings, bespoke solutions, dedicated support and The importance of well-being to your efficieny. Within the Family & Novotel concept, we provide for two children up to 16 years old a homestay lodge and free breakfast; as well as special presents for children during check-in, a children’s corner where they can develop their creative and mental skills, and special menu options for kids. Conveniently close to city center, historical areas and the main shopping district of the city , ibis Istanbul City West Hotel offers a service is in perfect accordance with international standards so to meet all the accommodation needs of its guests. Hotel has 228 modern and comfortable rooms where you will find comfortable “sweetbed” beds specially designed for ibis hotels, a mini refrigerator, a high-definition plasma television, a safe box, free tea & coffee service, and free wireless internet connection. Designed with the satisfaction and entertainment of its guests in mind, ibis Istanbul City West hotel is an ideal choice both for business and leisure travellers. There is a 7/24 food & beverage service at the hotel where you can find both flavors from the world cuisine and examples of delicious local dishes. ibis Istanbul City West Hotel presents international service standards of ibis, a world leader economy hotel chain, with its service-friendly staff and convenient prices, without any concession on the principle of high quality service. Only 1 km from Ataturk Airport, the WOW Airport Hotel offers 24-hour front desk service, and rooms with interactive flat-screen TVs. There is a metro station just a few steps from the hotel, providing easy access to the city centre. Trendy The Lobby Cafe serves alcoholic and non-alcoholic beverages on the lobby floor. The rich breakfast buffet includes an array of pastries and rolls, unique jams and fresh fruit. At each of WOW Airport Hotel's room, guests will have the luxury of controlling the room’s illuminate and temperature with just a single touch of a bedside button. All rooms include an interactive flat-screen TV. WOW Airport Hotel’s gym features the latest training equipment. The health club offers a wide range of treatments, including aromatherapy, reflexology and Thai massages among other therapies applied using latest technology. A Finnish sauna and a marble hammam are also available. A boutique, a beauty salon with hairdresser and a grocery can be found inside the WOW Airport. The hotel offers free airport shuttle services during day hours. Istanbul World Trade Centre, Istanbul Exhibition Centre and the CNR Expo Exhibition Centre are just 1 km from WOW Airport Hotel. Istanbul city centre is about 16 km away. Conveniently located beside Ataturk Airport, within walking distance from Istanbul World Trade Centre and CNR Expo Centre, WOW Istanbul offers 5-star comfort and convenience. It has an indoor pool on the top floor under a glass ceiling and luxurious massage treatments. Free private parking is available on site. All guest rooms at WOW Hotel come equipped with satellite TV and a minibar. Every room has a bathroom with high-end complimentary amenities. Restaurant Mezzaine and Choppers Point Istanbul serves and exquisite selection of Turkish and international dishes. Lobby Bar on the lobby floor is open 24-hours per day. WOW Istanbul Hotel’s health club has a modern fitness centre and diverse beauty treatments using sea moss, honey and clay. There is also an on-site hair salon. DTM-İstanbul Fuar Merkezi Metro Station is 200 m from the hotel, providing a direct connection to central Istanbul in 15 minutes. A free shuttle takes you to and from Ataturk Airport. Atakoy Marina, offer city views. tea and coffee setup, minibar, bathrobe and slippers. There is also a bath tub in some rooms. Retaj Royale Istanbul is located only 7 km from Ataturk International Airport and CNR Expo Centre. Featuring chic interiors, the hotel offers an indoor pool and free access to fitness centre and hammam.Modernly decorated, the rooms of Retaj Royale Istanbul include a LED TV with satellite channels, air conditioning, and an electric kettle with tea and coffee making facilities. All rooms have a marble bathroom with a bath tub. Free WiFi is also available.Retaj Royale Istanbul's ZemZem Restaurant offers a wide selection of dining options, including both local and international cuisine. There is also a snack bar serving light snacks and non-alcoholic drinks.